Manager Derek McInnes said Aberdeen had got the "big result" they had been looking for in the Scottish Cup penalty shootout win over Kilmarnock. After the quarter-final replay ended 1-1 after extra-time, Dons goalkeeper Freddie Woodman made three saves to send his side through 3-2 on penalties. McInnes' side will play Premiership rivals Motherwell in the semi-final at Hampden on 14 April. "A great night for us," McInnes told BBC Radio Scotland. "We've been looking, searching for a big result. We haven't had it against the Old Firm this season and sometimes that can class as a big result and I thought tonight was a big result that we've been looking for. "I said to the players, 'it's not a lottery for me, penalty kicks'. It's all about concentration, it's technique, it's confidence and having that mentality to finish your penalties. "I was confident in all five of them and I was hoping my keeper would produce a couple of saves and one in particular I thought was outstanding, or so I was told because I wasn't watching." Stephen O'Donnell fired Killie ahead in extra-time after Eamonn Brophy had escaped Shay Logan to set the full-back up. Kenny McLean equalised from the penalty spot after Kirk Broadfoot had fouled Stevie May. "It was eventful, it was a typical quarter-final," said McInnes. "Two teams who were slugging it out. "I think it's a foul on Shay Logan. Brophy just barges into him and takes him out. Really disappointed with that. "But the response was great. We get the penalty kick. I just felt we were the team who were maybe going to nick it in extra-time, but it'd have been harsh on Kilmarnock and obviously it comes down to penalties. "[Kenny McLean] carried the fight. I started him in the middle of the park. I moved him up at centre-forward. He was winning headers, he was running beyond, he was spreading the play, he was winning tackles." 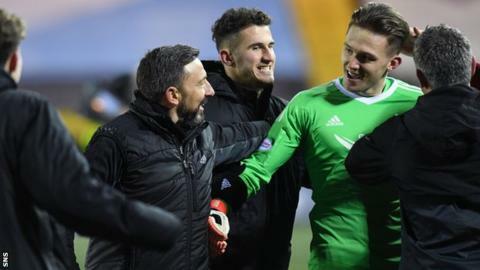 McLean was one of six Aberdeen players booked at Rugby Park and he along with Logan and captain Graeme Shinnie will be suspended for the semi-final. "We're just glad to be in the semi-final." Killie boss Steve Clarke congratulated Aberdeen on reaching the semi-final and reflected on "a competitive cup tie". "When we got the lead in extra-time, I thought maybe we could see it out, but it wasn't to be," said Clarke. "It's been a hard run of games for us. That's six games in 18 days. It's a big ask. In same period of time, I think Aberdeen have played three games. "I think in 90 minutes, no problem. Physically, we were there. I think just towards the end, when it came to seeing the game out, maybe just a little bit of mental and physical fatigue. "If we get it right on the pitch and and we get it right off the pitch here at Kilmarnock, we can challenge for the top six [in the Premiership]. "You couldn't really ask for a better game, could you, to bounce back in? Rangers away [on Saturday] will be a good one, but we'll be ready."